By now you know that for weeknight meals, we are all about efficiency. And by the looks of my Analytics, it looks like you guys are too. (“Quick” shows up consistently as one of the top 3 most-clicked Categories.) But the weekend? That’s another story entirely. Especially when the weekend in question conspires to create the most conducive dinner-making conditions in modern history: Grandparents = in town; weather = glorious; farmer’s market = open; kids = not cranky; and only two officially scheduled events for the entire day: Early morning soccer practice, and a 6:00 cocktail on the just-opened-for-business patio. On days like this, unconsciously or not, dinner is something that only barely resembles the scramble on the weeknight. We talk about it and shop for it and cook for it all day long. 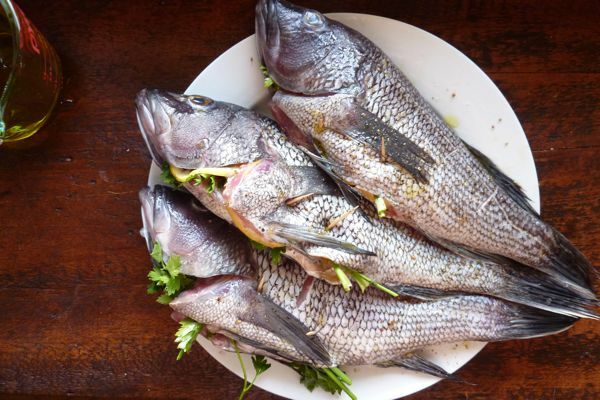 You might even say we make things as difficult as possible for ourselves — plying the kids with cider donuts while we wait in the interminable line at the market to secure the beautiful local sea bass you see below; whisking homemade mayonnaise to serve with French fries when, really, is there anything wrong with Heinz? ; tracking down the spring-iest spring greens available (sorrel was the winner); pureeing asparagus into the vinaigrette that we will drizzle on top of those greens; digging out the fancy crystal tumblers for gin and tonics — which is another way of saying it’s our idea of the best day ever. Spicy Fries with Homemade Mayonnaise. I used some very green looking olive oil to make my mayo, which accounts for the very green color. Don’t let it fool you, though: Delicious! And paired nicely with the fish, too. Pat the fish dry with paper towels. Fill the body with lemon slices, fresh herbs such as cilantro or parsely and drizzle in a bit of olive oil, a squeeze of fresh lemon juice, salt and pepper. Seal it with toothpicks as shown above. Score both sides (that means make a few slits in the skin) and brush with plenty of olive oil. (Very important so it doesn’t stick.) Grill for about 4 to 5 minutes per side and cut each filet off the bone. Trim fresh asparagus of its woody ends. In a skillet, boil asparagus for 2 to 3 minutes and immediately plunge into ice water. (I attempted to shave the asparagus at this point — see: making things difficult — but I didn’t make it very far and ended up just chopping it into 1-inch pieces, reserving about 2 spears for vinaigrette.) 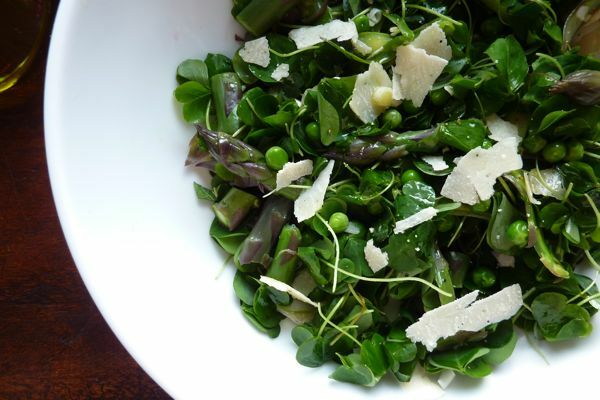 Toss asparagus with a few handfuls of sorrel (or the freshest spring greens you can find), peas, chopped fresh mint, a handful of chopped scallions (or shallots), and shaved Parmesan. Chop reserved asparagus in large pieces and add to a blender with a heaping tablespoon Dijon mustard, 1/3 cup olive oil, a tablespoon red wine vinegar, salt, pepper, small squeeze of lemon, and a little water. Blend/Liquefy until you reach the desired consistency. This is one of those feel-your-way recipes, so you might have to add more water until you get it the way you want it. Once you get it there, toss into your salad. The recipe for Spicy Fries — a new favorite in the house — is in my book, so you only have to wait a few more weeks for it. As for the mayo? I’ve had a long and complicated history with homemade mayonnaise. Well, it’s actually not that complicated. It comes down to this: Making mayonnaise from scratch requires precision and patience, two qualities that I am severely short on. But on this particular wide-open Saturday, I decided I had no excuse not to man up and try again. So I dripped drop after drop of olive oil into my egg following Alana Chernila’s instructions as patiently as my impatient wrist would allow. Whisking in between. Drip. Whisk. Drop. Whisk. Drip. Drop. Somehow I managed to tap into a (heretofore unknown) meditative state and do it. This all looks so beautiful! What are your thoughts on making homemade mayo in the food processor? Do you prefer the hand method? I made some in the processor last week — it was a mayo with orange zest and thyme for a pasta salad — it came out great, seemed to bind very well. I drizzled the oil in a steady stream. The mayo recipe was from one of the ‘Silver Palate’ books. This menu gets me so excited for spring! I have a dumb question: If I don’t want to make my own mayonnaise but I do want to have french fries, can I use Hellman’s? 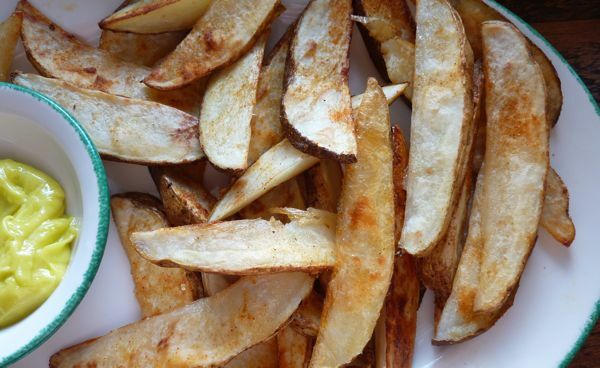 Or when you have mayo with french fries is it just better to have homemade? Just curious. Your Sorrel Salad sounds just perfect for the summer nights we have been having. I hope I can find sorrel at the West Side Market, so I can enjoy this salad over the weekend. Love this post! I grow my own sorrel in our community garden and love using it gremalada style over my pan-seared artic char with sorrel. Don’t you wish weekends were as long as weeks?